ISM Training – Entrepreneurship with vision! For the “Interactive Strategic Management (ISM) methodology for improvement of agricultural entrepreneurship in Central-Eastern Europe” project a generic strategic three-day training for groups of 8–10 farmers was implemented that led to a personal strategy and action plan for each participant. The environment: market and society. In the first part of the training (1.5 days), the farmer analyses these aspects while in the second part of the training the farmer translates this analysis into a suitable strategy and an action plan (1.5 days). 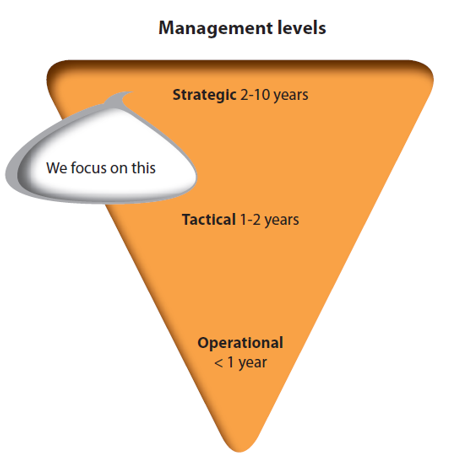 After about a year, there is a fourth meeting – the so-called return meeting – to see what has happened with implementation of the strategy (see Figure 2.2). About 8–10 farmers participate in each group. The group is facilitated by a qualified trainer. The role of the trainer is crucial in the training, a factor that will be elaborated on below. Interaction is an important aspect. The farmers are asked to discuss with and challenge each other. The trainer also has this role. Homework assignments are used to create interaction with the outside world and to organise reflection on the process of developing a strategy. A web-based tool is used to structure and support the process. 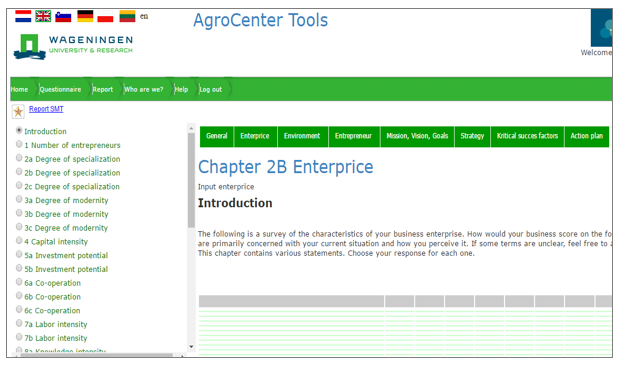 The tool consists of a list of questions a farmer has to answer to ensure that all aspects are taken into account. As part of the tool the farmer must also give a score to the three E-elements: Entrepreneur, Enterprise and Environment. After this analysis, a switch is made to the future strategy. The starting point for this is the farmer’s personal ambition and vision. The farmer himself has to combine all of the gathered information to transform it into a few possible strategies, he then has to evaluate these alternatives and finally come up with his own personal strategy. The tool also calculates a ‘fitting score’ for strategy categories based on the score the farmers have given to different aspects of the three E’s. The farmer can use this calculation as inspiration or to reflect on his own choice. In the last step, the farmer prepares an action plan along with a presentation of the background and content of his strategic plan. The process leads to a strategic plan. Each part of the process includes collecting data, considering and interpreting this information and communicating this with others. The challenge is to find a link between the different elements and use them. Another challenge is to use and increase the innovative potential of the farmer and the farm. Being creative is a key factor in this, which implies that a farmer searches for the ‘why’ of certain events and benefits from this. 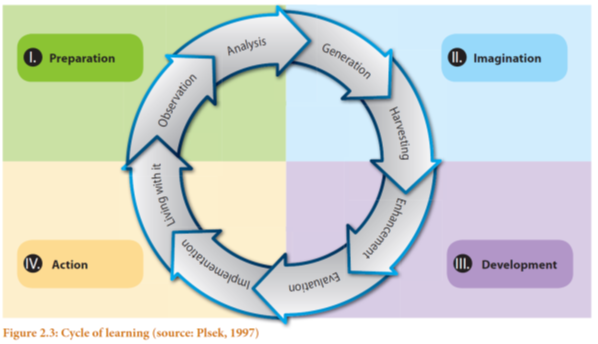 When discussing creativity and the process of learning, the learning cycle of Plsek (1997) will be used (see Figure 2.3). The first phase consists of observing and analysing: accumulating experience and considering the observations. The second phase comprises imagination and generalisation. The observation component is more abstract and general. The third phase consists of the development and evaluation of new ideas. The fourth phase involves the active implementation of ideas; in other words: abstract concepts are applied by implementing them in new specific situations. This will, in turn, lead to a new specific experience.